Hershey's has some great new Easter products being sold exclusively at Walmart. 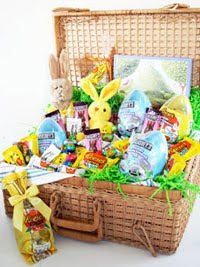 The basket pictured above includes many Hershey's goodies that are available only at Walmart. I was given a virtual Easter basket by Colleen from Mommie Daze to join Hershey's Better Basket Blog Hop! Hershey is going to donate $10 per blog post up to a total of $5000 to Children's Miracle Network! How awesome is that? We can help them raise money virtually! I would like to pass this virtual basket on to every one of my readers! Y'all are the best! I would like to encourage each one of you to publish a post about Hershey's Better Basket Blog Hop in order to help raise money for Children's Miracle Network! I think I could eat that whole basket today.